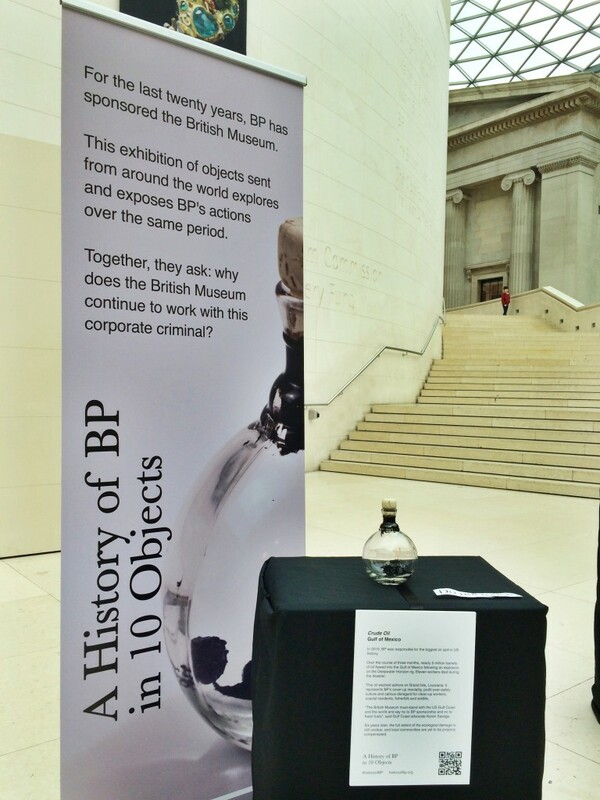 We pretend to be BP staff at press launch of new BP-sponsored exhibition – BP or not BP? Posted on September 12, 2017 September 14, 2017 by BP or not BP? A surprising number of attendees at the private press viewing of the Scythians exhibition thought that this was a genuine BP banner. Photo by BP or not BP? “We love Russia deeply – it is responsible for a third of our oil and gas output. Our hope, in sponsoring this exhibition, is to smooth relationships between Putin and the West and end the economic sanctions that prevent us from drilling in Russia’s Arctic. “That’s right, we’re sponsoring the past and destroying the future”. Photo by Diana More. The banners used BP’s logo and fonts, and many attendees did not immediately realise the display was a spoof, even though it contained the slogans “BP: Making You History” and “Sponsoring the past, destroying the future”. Some people still seemed to believe the display was legitimate, even after the “BP” characters explained that they were only sponsoring this exhibition to clean up their image, distract the world from climate change and lobby for an end to economic sanctions on Russia. Others immediately got the joke, well aware that BP’s sponsorship of the museum is highly controversial. This person didn’t seem to believe we were really from BP. Photo by Diana More. BP Brand Enforcement Ambassadors: poised and ready for some public-facing relationship management opportunities. Photo by Diana More. BP’s core values on display. Photo by Diana More. British Museum staff and security were delighted to welcome us, their loyal sponsors, to the exhibition. Photo by Diana More.